Welcome to the Pumpkin Patch! 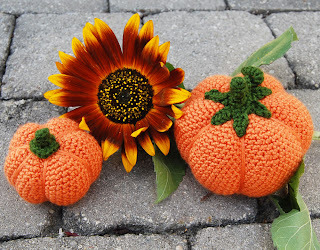 I'll be using this page as a home base for everything you need to know about the Pumpkin Patch Crochet-Along, so make sure you bookmark it! The official sign-up period ended Sept 10, but you can still join us for the crochet-along. Just visit my Ravelry shop and get a copy of the pattern for Pumpkin #1. You can get caught up on the lessons from the Post Index section below and post your pumpkin pictures in the Flikr group! Remember that we'll be having a pumpkin contest starting on October 25 and your finished pumpkins must be loaded to the Flikr group by then to qualify! Show it off -- you know you want to!